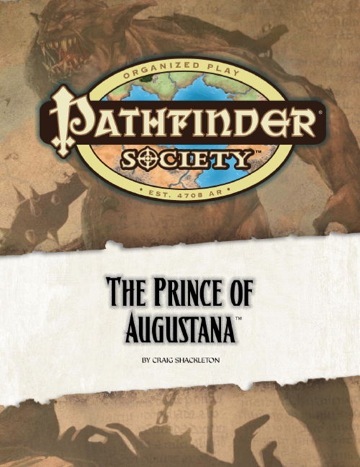 When an old beggar shows up filthy and injured on the doorstep of the Augustana Pathfinder Lodge in Andoran and demands to be recognized as Andoran's one true Emperor, Venture-Captain Wallace is inclined to chase him off. But when the old beggar reveals a wayfinder and tells a tale of demons and portals to another world beneath the streets of Augustana, Wallace summons you from Absalom to investigate. Will you make it through sewers, swarms, and sanctuaries to uncover the truth or will the dangers of the Augustana underworld consume you forever? I will check back to make certain session is happening & try and let you know ASAP if any acts of god prevents US from being able to attend. Right now she has been poking me to get us back into some sessions. Sweet... well wife and I plan on showing up... she has asked for me to make a quick stop at Joann's for her to check on some floss.. we then are grabbing some dinner and will be there BEFORE 6PM barring acts of God. I just wanted to drop a quick note and thank one and all for the game..
On a side note Friday my mom-on-law had a fainting issue when she was out at theraphy, it was very bad and troubling one enough so that she is in Metro hospital at this time as they try and figure out what occured. The fainting happened when she was sitting and then after the moved her to a bed.. and she 'woke' from it she was very disoriented and while reclined passed out again. At the hospital she was still very disorreinted and thus she was admited. That is all I am going to say for now.. save Thanks again for a great game on Thursday. I will be reaching out to e-mil in private when I am in a better mind set about what was discussed at the table.